Photograph collection of webmaster. A relatively smart looking 25164 at Crewe, date unknown, but most likely not long out of Derby Works. The boiler room grilles have been sheeted over. Almost nineteen years of service for D7514/25164 was spent allocated to London Midland & Western Region depots. Center lampbracket & other fittings removed No.1 cab only (October 1978). August 1967 to the Nottingham Division (D16). 25164 was the 189th Class 25 withdrawn, being one of six withdrawn during August 1983. 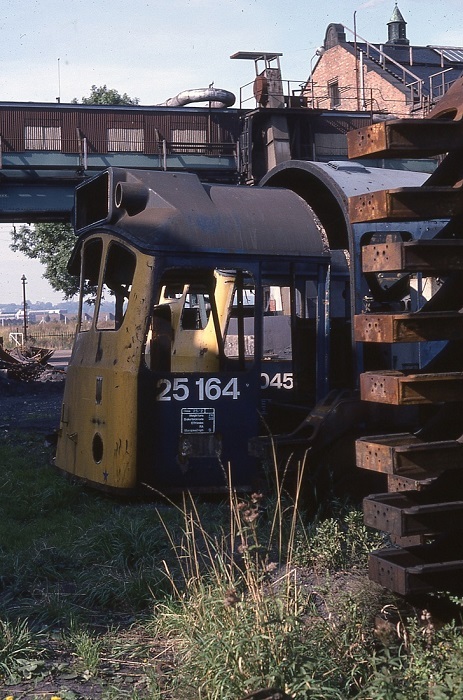 After withdrawal 25164 was moved to Derby Works by the first week of October 1983 and remained here until forwarded to Swindon Works on July 24th 1985. However Swindon Works closed before 25164 was broken up, it was moved to Cocklebury Yard on June 3rd 1987, Humberstone Road by June 5th 1987 and into Vic Berry's yard by June 8th 1987. It was placed in the stack until removed during November 1987 and was broken up by the middle of December 1987. Noted Derby Works June & July 1977. Noted Derby Works June, November 1978. On August 24th the 10.10 Newcastle - Cardiff arrived at Cardiff with 7514 & 16, presumably the Class 45 had required assistance from ?? A Leyton depot - Nuneaton empty ballast (?) was noted through Cambridge with 7514 on October 19th. Although it was allocated to Ebbw Junction at the time 7514 with 7619 worked the 07.00 Nottingham - St. Pancras on July 7th 1972. During early April 1975 strikes and severe wintry weather caused disruption to locomotive rosters. Badly affected was the 08.52 Swansea – Paddington which ran with an assortment of power, mixed in with the Class 37s was Ebbw Junction allocated 25164 on April 2nd. It is not recorded how far the Class 25 worked. May 24th found Cardiff allocated 25164 on weedkilling duty in the Ilkley area! On July 8th 25164 worked the 11.06 Bristol Temple Meads - Cardiff and the 17.05 return. Although 25164 was allocated to Crewe during January 1976 it was not until the middle of 1977 that it picked up some familiar passenger workings. On July 17th & 18th 25164 & 25122 worked a roundtrip Derby - Skegness. 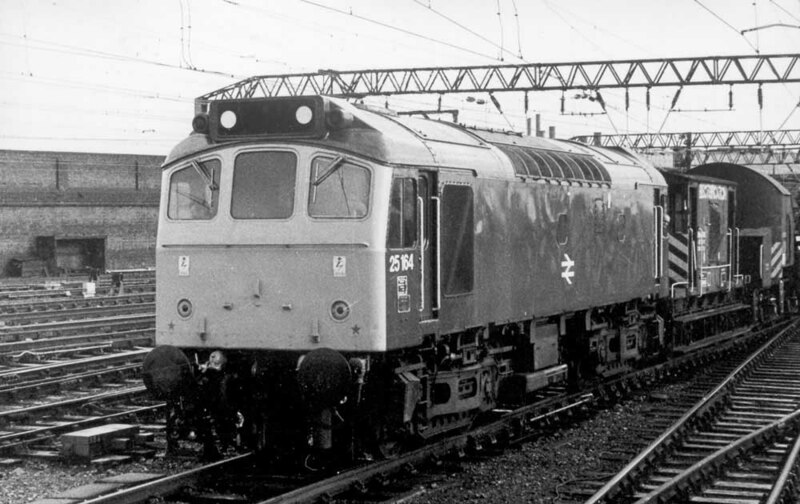 On July 18th its also reported that (contradicts previous note) 25164 was tested on a London service presumably to Leicester, 45129 was the train engine. 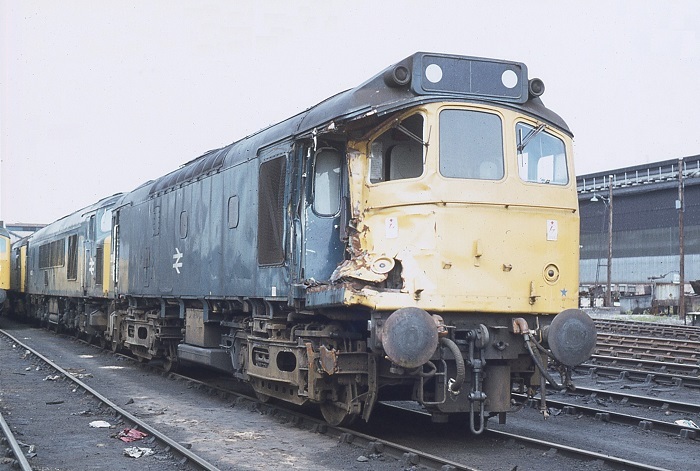 June 1978 finds 25164 in the deadlines at Derby Works awaiting repairs to its cab damage. A cab exchange was later made, the damaged cab being dumped near the power station, still bearing its builders plate. Photograph collection of webmaster. The cabs of 25164, 25045 and one Class 45 on September 23rd 1978. On March 3rd 25164 was stabled at Birkenhead Mollington Street attached to an electric multiple unit. Skegness was also visited on five consecutive days during July 1979. Round trips from Leicester were completed with 25136 on July 15th/16th/18th & 19th. On the 17th only the outward leg was worked. A total of 918 passenger miles were completed. A Horsehay & Dawley - Port Talbot girders train was worked by 25164 on July 11th. During 1981 four trips were worked to Aberystwyth. On July 11th 25164 & 25119 worked the 10.10 Euston - Aberystwyth forward from Birmingham New Street. Two weeks later on July 25th 25164 & 25130 worked the 07.40 Euston - Aberystwyth from Wolverhampton, returning with the 16.05 Aberystwyth - Wolverhampton. The next day (26th) the same pair worked a Lincoln Central - Aberystwyth day excursion from Wolverhampton to Aberystwyth and return. The final recorded passenger workings took place during 1982. On August 12th 25164 worked a Bangor - Manchester Victoria service. On September 5th 25164 was attached to a withdrawn Class 503 electric multiple unit at Birkenhead Mollington Street. On October 30th 25164 worked an unidentified service between Preston & Blackpool. Photograph collection of webmaster. 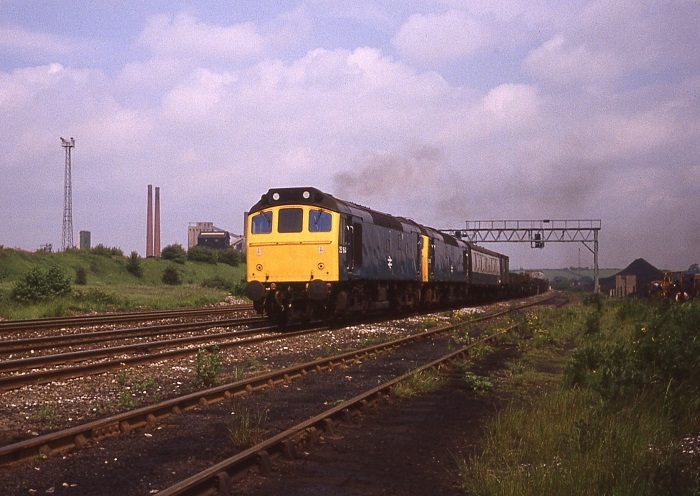 Two Class 25s led by 25164 head southbound at Tupton, date unknown. Some of the Avenue Coking plant is visible in the background. 25164 & 25027 were stabled together at Buxton depot on March 12th. On the damp morning of April 19th 25164 & 25240 were noted passing Chester with ballast wagons headed for Penmaenmawr. 25164 & 25042 were noted southbound at Warrington Bank Quay station with a mineral train on May 23rd. On June 1st 40158 was noted hauling a failed 25164 and loaded ICI Hoppers westbound through Stoney Bridge, Timperley. 25164 was withdrawn on August 21st 1983. No.2 cab front: driver's side, large rusty dent on corner below handrail: at least September 1981 until withdrawn. No.2 cab front: 2nd man's side, damage to valencing above multiple unit cable receptacle: at least September 1982 until withdrawn. Page added March 7th 2013.